Custom Leather Look Pen Notebook Personalized in Bulk. 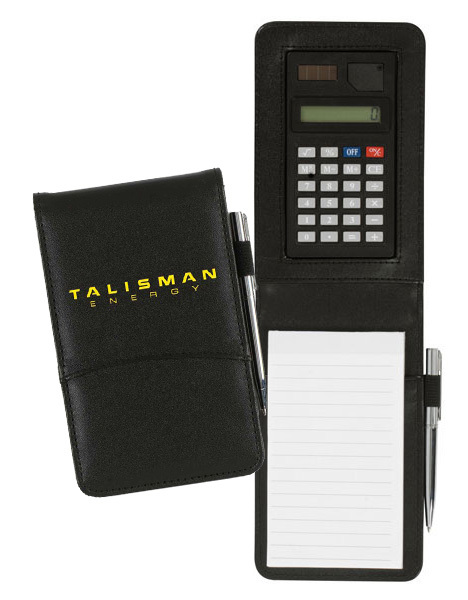 Personalized Leather Look Pen Notebook & Calculator Custom Printed in Bulk or Blank. Promotional, Inexpensive. On Sale! Budget Prices in the USA and Canada. Leather Look Notebook comes with solar calculator, pen and mini a notepad. Wholesale advertising, lowest cost in North America. Free Art Design and includes 1-Icolor custom imprint on one side.